Would you say that the monastic tradition of liturgy contrasts to the ‘courtly’ diocesan form of ritual, especially after Trent? That is my impression. My own sense and understanding of the traditional liturgy is more from reading the French Benedictines, and from Cardinal Ratzinger. It seems that most of the liturgical movement drew from the monastic tradition, as opposed to the Baroque and modern diocesan traditions of ritual. 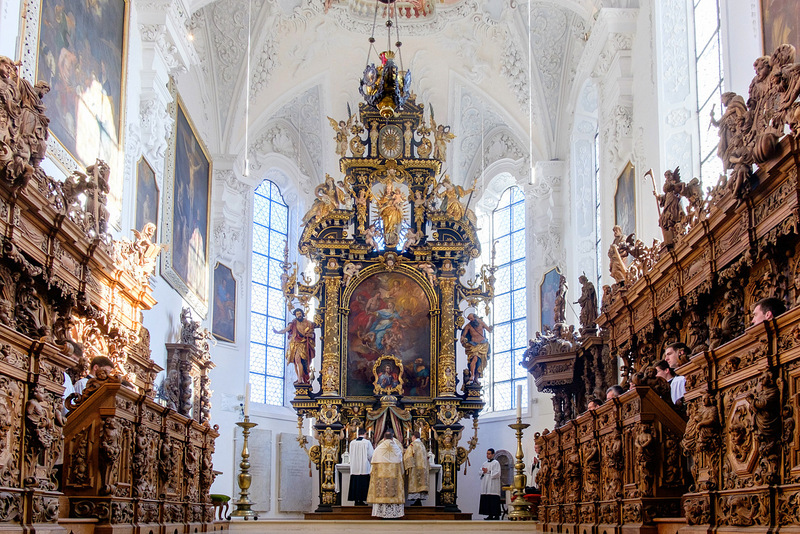 Might a renewal of the traditional liturgy drawing more from the monastic tradition answer the ‘needs of modern man’ more than a courtlier Baroque form? This is an interesting point. If one doesn't look too closely at the age of Cluny, it would be true to say that monastic liturgy is, on the whole, simpler; nor is it surprising that so many of the pioneers of the Liturgical Movement were Benedictine monks who sought to share the wealth they had preserved, particularly in the form of the Divine Office, with modern people who still felt moved by the witness of the monks and nuns when the golden glow of the Baroque had long since faded. In every era until our own (and even now, in places where communities are faithful to their original charisms), the monastic liturgy has retained a profound consistency, tranquility, dignity, and loving attention to detail, which makes it especially suitable for emulation and transplantation. We should not forget, however, that the abbot, a prelate in his own right, is treated regally according to the rubrics of the traditional Mass, and that the equation of ‘monastic’ with austere, angular, and efficient is more a heritage of Collegeville than of any thriving monastery prior to about 1950. Nevertheless, while I would want there to be a place for relatively simpler liturgy (as long as it was still thoroughly traditional), I also think we should not underestimate the “shock value” of Baroque liturgy. It is so different that it has something special to tell us right now. The Institute of Christ the King, with its French Baroque style of celebrating solemn functions, is making an important contribution to the life and mission of the Church today precisely by recovering and giving a suitable place to a rich part of our Catholic liturgical tradition that people who are too wedded to democracy and pragmatism have lost, or never cared to acquire. We need many tongues for proclaiming the Gospel; we have room for, and a need for, as many manners of celebrating authentic liturgical rites as our history has developed. One may go so far as to state that Baroque grandeur and excess are needed in direct proportion to contemporary reductionism and trivialization. Gregory DiPippo also pointed out to me another angle of argumentation that I had not exploited in my original post. When we are considering the courtliness of liturgy with its irreducible monarchical and aristocratic elements, we should not forget to breathe with both lungs of the Church. The Byzantine Divine Liturgy is positively bursting with courtly imagery and gesture, as befits its long sojourn in Constantinople. The Byzantines have retained many of these features because they did not succumb to the minimalism, utilitarianism, and democratic thinking that have poisoned the springs of Western social life and made of us men with hollow chests. Byzantine Christians have all the same kinds of “courtly” rituals that the Roman Rite has, such as the kissing of the celebrant's hands, the bowing towards persons, icons, and other objects, the candles, and the incense, rituals that had their origin in the veneration surrounding the emperor. Nor should we be surprised: both the Byzantine court and the Carolingian court saw themselves as continuations of the Roman Empire, now consecrated in its new role as supreme governor of the Christian world, for the glory of God and the empire of Christ. It was completely natural to the clergy and faithful to adopt for their divine worship customs that accompanied the earthly ruler; indeed, in so doing, they restored, as it were, the proper immovable and incorruptible object of veneration, bestowing on the ruler the privilege of being an earthly icon of the divine King. What began on earth was raised to heaven and seated there at the right hand of the Father; thence it descended to the human throne as a mantle of authorization and responsibility. All four of the Cherubic hymns refer to Christ as King. Now the powers of heaven do serve invisibly with us. Lo, the King of Glory enters. O, the mystical sacrifice is upborne, fulfilled. Let us draw near in faith and love, and become communicants of life eternal. Of Thy mystical Supper, Lord, let me partake, O Son of God, for of Thy mysteries I will not speak to Thy enemies nor kiss Thee like Judas, but like the thief on the cross I will confess Thee: In Thy Kingdom, Lord, remember me. Let all mortal flesh keep silent, and stand with fear and trembling, and in itself consider nothing of earth; for the King of kings and Lord of lords cometh forth to be sacrificed, and given as food to the believers; and there go before Him the choirs of Angels, with every dominion and power, the many-eyed Cherubim and the six-winged Seraphim, covering their faces, and crying out the hymn. The Byzantines currently use the last of these only on Holy Saturday, but it was the daily use Cherubic hymn for the Liturgy of St James, which is currently undergoing something of a revival among the liturgically outré. The traditional Old Church Slavonic version is incredibly impressive. It was once common to say, and one still hears it said once in a while, that the Mass is a mystical representation of the life of Christ, that it makes His life present to us in all of its mysteries, as if recombining the spectrum into pure white light so that all the colors are virtually there in a single moment. Since this is true, we must say that ALL phases of the life of Our Lord are present and active, including the 2,000 years of His Mystical Body over which He reigns as the glorified King and Son of God (in the Davidic and more than Davidic sense). In fact, while the Mass is the sacramental renewal of the once-for-all sacrifice of Calvary, we know at the same time that it is the offering of the risen Lord in His royal dignity, power, and beauty. Thus, however much we rightly emphasize the Passion, the Mass should be for us a tangible (i.e., sacramental) encounter with our glorious King. The traditional Roman rite, especially in its sung and solemn forms, does exactly this, in company with all the Eastern rites. 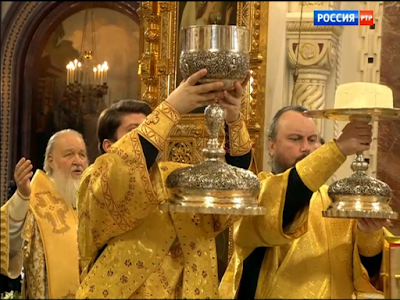 It is currently, for some odd reason, fashionable to admire the colorful extravagance of the Byzantine liturgy while contemptuously dismissing anything in the Latin tradition suggestive of the same. We admire gigantic gold vessels and rich vestments in the East while settling for unsightly cups and drab drapes in the West; we catch our breaths at an impressive iconostasis, while shaking our heads at altar rails and other signs of separation between the nave and the sanctuary; we extol the marvelous poetry of the kontakion or troparion sung to a haunting traditional melody, while leaving our own incomparable Gregorian repertoire out in the cold. I doubt NLM readers are afflicted with this peculiar double standard or hypocrisy, but its ubiquitous presence in the halls of academia and power suggests that we are dealing with a psychological disorder, a kind of self-loathing that compels some people to strip themselves of the treasures of "the other" and to force themselves into a plainness that is almost a punishment or an echo chamber of one's own emptiness. We can point to the beauty elsewhere, like a tourist passing through Versailles, as long as we deprive ourselves of it here and now, and suffer our democratic fate. This, eventually, is where the rejection of Christ's kingship will lead, and has already led. His royalty will either be fully embodied in and expressed through our primary, fundamental, and culminating public, political, and civic action, namely, the sacred liturgy, which will form the reference point and stable basis of Christian society; or it will be rejected and replaced by the tyranny of man over man, the tyranny of fashion or ideology: "We have no king but Caesar." "The liturgy had taken over from the court ceremonial of the pagan emperors the symbolic language for the presence of the supreme sovereign: candles, which preceded the emperor, and the thurible. Whenever candles and incense appear in the liturgy, they indicate a new culmination of the divine presence" (Martin Mosebach, Foreword to P. Kwasniewski, Noble Beauty, Transcendent Holiness [Kettering, OH: Angelico Press, 2017], xxii).